Friuli is a melting pot of cultures and its borders have altered over many years. It sits between Austria and Slovenia and there is an overlap of ethnicities, traditions and cooking. It has three distinct geographical areas, each has their own distinct culinary character and traditions. Carnia in the northern mountains, the central Friulian plains and southernmost Friuli which borders the Adriatic coast. The isolation of the Carnian Alps has resulted in a self-sufficiency where families still raise their own livestock and farm the land. Large scale agriculture is difficult and, as a result the diet is based on what was found in the fields and forests. Wild mushrooms, wild asparagus, radicchio, wild herbs, berries and apples all feature and if you visit at the right time of year there are festivals to celebrate all these natural bounties.Apple cider was often made from bruised and leftover fruit. Common to all of Friuli are the three staples; polenta, beans and potatoes – food of the poor. Game such venison, pheasant and fresh fish such as trout were also available. In order to maintain the shelf life of meat salt and smoke curing were used. Prosciutto di Sauris, from the small village of Sauris di Sotto, is one of Carnia’s most recognised products. Hams are smoked using a combination of herbs, juniper and beech wood. Cows were a mainstay of the local economy and even the poorest family owned a cow. The milk being used to make fresh butter, yogurt and cheese. Montasio cheese is one of Friuli’s top food exports. It is produced in three forms; fresh; semi-aged and aged. Ricotta affumicata (smoked ricotta) is a speciality which is difficult to find elsewhere. The ricotta is smoked above the traditional family stove, the foglar, – the lovely open fire with a hooded chimney where a cauldron would be placed above the open fire where much of the cooking took place. The fogolar is a symbol of warmth, sociability and cooking – a true gathering point. The smoked ricotta has a unique flavour which is a perfect finish grated over pasta and gnocchi. The majority of Carnia’s food came directly from the land but one significant food source was introduced by travelling pedlars called cramars. They brought an assortment of goods from the markets of central Europe. Spices such as cinnamon and nutmeg are added to cjalsons – perhaps Carnia’s most distinctive dish. These are a type of stuffed pasta with complex stuffings of both the sweet and savoury variety which can include potato, cheese, herbs, fruit, nuts or chocolate. Each cook has their own mix and sweet and savoury flavours often overlap. Both sweet and savoury cjalsons are traditionally served in melted butter and topped with smoked ricotta and a sprinkle of cinnamon and sugar. Austria’s influence is evident in the many types of gnocchi (dumplings) that appear throughout Friuli. In Carnia these dumplings are made from local ingredients such as ricotta cheese, pumpkin, herbs and prosciutto di Sauris. Delicious jams, fruit syrups and honey are produced throughout Carnia. Honey made from dandelion (tarassaco) is the most characteristic but there is also rhododendron, blue-berry, mint, rosemary, chestnut, sunflower, heather and clover. Desserts are simple and rustic. Cakes, tarts, breads and strudels are made with locally grown apples, pears, berries, pumpkin or nuts. Frico Croccante is a speciality which dates back to the 15th century. It was originally a sweet dish of fried cheese sprinkled with sugar and cinnamon. For the peasants of Carnia, Frico was, originally a way of using up leftovers when the cheese rinds were tossed into a pot to form a crisp pancake. Frico croccante is a crispy cheese basket filled with a local speciality such as sautee mushrooms. Frico made with potatoes is a potato and cheese pancake served with a main course. Polenta (or maize) was and still is a staple food in northern Italy. The maize originated from South America and was introduced into Europe by Columbus and has been used as a staple food since the 16th century. Nowadays it is the ubiquitous side dish throughout Friuli. It can be served either soft i.e. direct from the pan or grilled to accompany savoury sauces or grilled meats. In it’s original form it might have been served as a creamy porridge topped with fresh ricotta and browned butter. Pearl barley, orzo, is often used to replace the rice in a risotto and is very popular when served with wild mushrooms and Montasion cheese. Buckwheat flour also features and is used to make blecs, a buckwheat pasta served with smoked ricotta, cream sauce with mushrooms or a wild game sauce. Pumpkins feature in soup, frico, gnocchi, as a puree or in cakes and a festival is held in honour of the pumpkin in October in the small town of Venzone. Central Friuli is characterized by low, flat plains with occasional hill towns – the most centrally located is Udine. There is a strong Venetian influence throughout Friuli in its architecture, language and cooking. Cured meats are a speciality. Pitina is a salami made from ground mutton seasoned with herbs, dredged in cornmeal and smoke-cured using juniper wood. Salami cooked with onions and vinegar is served throughout central Friuli, traditionally with polenta. 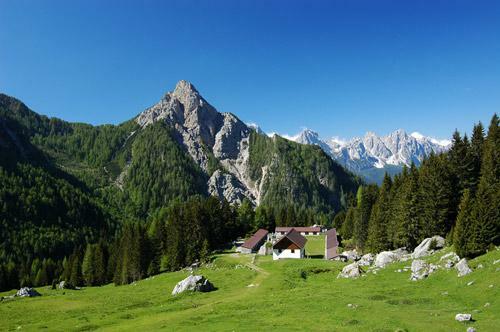 The mountains north of Pordenone are also home to a type of salted cheese called Asino. This cheese is used to stuff the traditional cornmeal dumpling – balote. Cured goose and duck breast were created by the region’s modest Jewish population and today are produced in the southern plains of central Friuli. Baccala – salt cod is popular throughout central and southern Friuli. It is a remainder of centuries of Venetian rule. Smoked herring and trout are available from San Danieli which is also home to the most famous pork product -Prosciutto di San Daniele. The dry climate and fresh breezes of this quiet hill town are said to be the perfect environment for curing the hams. The traditional diet was the frugal food of farmers, hearty grains, vegetables especially those with a long shelf life like potatoes. Beans, barley, rice and corn were easily dried and stored. During the winter the Friulians subsisted on polenta, made from stone ground dried corn, barley and bean soup enriched with pancetta or smoked pork and turnips were preserved through fermentation in grape skins to make brovada – the most typical of winter side dishes but a bit of an acquired taste. White asparagus is a celebrated speciality with a festa dedicated to it. It makes a lovely starter when lightly boiled, rolled up with San Danieli prosciutto sprinkled with grated Montasio cheese and baked in the oven until the cheese has melted or used in a risotto. The regions Slavic influence is especially apparent in eastern Friuli, home of the lovely cake gubana. It is a enriched dough filled with raisins soaked in grappa, nuts and spices rolled into a spiral. It originates in Cividale and the name is from the Slovene word guba meaning wrinkled or folded. Southern Friuli, including the Adriatic coast was Europe’s gateway to the east with port of Trieste playing a pivotal cultural role. Fresh, local fish figures widely and the Venetian influence is especially noticeable in typical dishes using salt cad, sardines, crab, langoustines and squid. As well as the abundance of seafood, the most distinguishing feature of the cooking is the Germanic influence which is most evident in Venezia Giulia which has been heavily influenced through its Austro-Hungarian influences. Cevapcici, a type of sausage with Slavic origins, is very popular. Pork, potatoes and polenta remain staple foods. These are often enhanced by the introduction of foreign ingredients. International trade brought in exotic spices. Cinnamon, nutmeg, cloves, caraway seeds and poppy seeds are used extensively in local dishes as is paprika, a mainstay of Hungarian cooking. The sweet-sour flavour known as agrodolce was introduced and appears in many vinegar flavoured dishes such as sardoni in savour. Sardini in savor is an ancient dish which has evolved out of the necessity to conserve fish and is a Venetian speciality. Sardines are dipped in flour and lightly cooked in olive oil until golden and then covered in a sauce made from lightly fried onions, white wine vinegar, bay leaf, salt, pepper and left to refrigerate for all the flavour soak in to the fish. A reminder of the Austro-Hungarian culture is the coffee houses found in Trieste – the home of Illy coffee where elegant Viennese cakes such as Sacher Tort, a very rich chocolate cake and Dobos Tort, a layer cake with chocolate butter cream and caramel, can be enjoyed. Strudel is a firm favourite as are cream and chocolate laced pastries. Three desserts which have originated in Trieste are Pinza, a plain sweet loaf traditionally eaten at Easter and Prenitz and putizza which are similar to gubana. Prenitz is named after a Slovenian Easter cake presnec and uses puff pastry rather than the enriched sweet dough of the gubana. It’s ingredients are very exotic and include dried fruits, chopped nuts, amaretti biscuits, Marsala wine, rum, cinnamon, lemon, sugar and honey. Putizza, named after the Slovenian pastry potica is similar to a gubanac contains chocolate in it’s filling. Cuguluf is a marbled pound cake cooked in a traditional kugelhupf round mould with a hole in the middle was a favourite of the Austrian Emperor Franz Joseph and a marbled chocolate version is very popular in Friuli. Apple strudel is thought to have been inspired by the Turkish baklava which was integrated into the Austro-Hungarian cuisine during the 16th century. Apples were introduced and it remains extremely popular. The pastry needs to be paper thin for an authentic light and delicate taste. Liptauer is a cheese made from fresh sheep’s milk, Lipto, named after the former Austro-Hungarian province of the same name now part of Slovakia. In Trieste fresh ricotta may be used instead of the Lipto cheese and mixed with a range of ingredients such as onion, anchovies, capers, mustard, pickles, parsley, chives and caraway seeds as well as paprika. Gorgonzola may be added. It is use d as a cheese spread for rye bread. Hearty soups are a traditional dish. Borlotti beans, pancetta, potatoes and often feature in the soups such as Minestra di Bobici – which includes sweet corn and Jota which includes sauerkraut. Brodetto alla Triestina is a local fish soup similar to many fish soups found throughout the Mediterranean the only difference being that the fish is pan fried before being added to the tomato based stock. Gnocchi are a big favourite throughout Friuli and in southern Friuli potato dumplings with a plum filling of Austro-Hungarian origin are typically served as a first course. They are served coated with breadcrumbs cooked in butter and sprinkled with cinnamon and sugar. Bread based gnocchi are similar to Austrian dumplings and served in beef broth or with a hearty meat sauce or with goulasch. Struccolo di Spinaze – a strudel made from pasta dough or a potato gnocchi dough with a spinach filling is served with a few spoons of beef broth or pan sauces from roasted or pan fried meat. The word goulasch is from a Hungarian word gulyas meaning herdsman. Goulasch came to Friuli during the Austro- Hungarian reign. It is a beef and tomato dish which traditionally uses paprika for flavouring and is served with polenta, potato gnocchi or mashed potato. Calamari stuffed with fresh bread crumbs flavoured with parsley are very popular. Greek immigrants introduced breaded and fried aubergines and courgettes. Potatoes cooked in a skillet, patate in tecia, are a dish originating in Trieste. Potatoes are boiled and then coarsely mashed with fried onions and pancetta, beef broth and black pepper until they start to brown. Other vegetable cooked such as sweet peppers, courgettes, cabbage, aubergines, and peasd with pancetta are cooked in a similar fashion where the individual vegetables are cooked in olive oil until tender and seasoned with salt and pepper, in a skillet. Fresh parsley, caraway seeds, cinnamon or cloves may also be added. Artichoke hearts stuffed with breadcrumbs, local cheese, fresh parsley and garlic are a local delicacy originating from Roman times.